A flammable liquid used in warfare, napalm has been used by the United States military since World War II. The U.S. was the first country to use napalm in warfare and is one of the few to still use it against enemy targets. Napalm gets its name from two of the main chemicals in its composition: naphthenic acid and palmitic acid. It sticks to skin and results in catastrophic burns for its victims, especially when it catches fire. Harvard University chemist Louis Fieser developed napalm in 1942. It was first used by the U.S. against Japan during World War II to burn buildings and as an anti-personnel weapon (meaning it was used on people). The U.S. continued to use napalm during the Korean and Vietnam wars, to devastating effect. The famous Vietnam War photo "Napalm Girl" shows a group of screaming children running away from a napalm attack where many of them suffered serious burns. Although made differently than in the past, napalm is still used by the U.S. military in combat operations. Modern napalm is known as "Napalm B." It is distinctly different than the napalm used in Vietnam and World War II. Napalm B is made of different chemicals than the napalm of the past. However, despite its different characteristics, Napalm B is often referred to by military personnel simply as napalm. Napalm B is usually comprised of plastic polystyrene and hydrocarbon benzene. These compounds combine to form jellied gasoline, which is extremely flammable and hot when ignited. Napalm B is much easier to control and manage when ignited than previous forms of napalm, which was so flammable that it often caught on fire when soldiers smoked cigarettes near it. 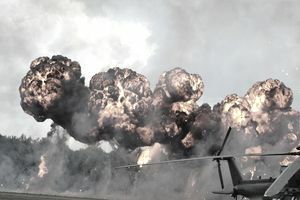 Napalm B is sometimes called "Super Napalm" as it burns much longer than older versions of the agent. It can burn for as long as 10 minutes, whereas older versions of napalm often burned for less than 30 seconds. Napalm B is known as an incendiary weapon as it can cause fire, explosions, and severe burns. It can also lead to asphyxiation in people who are close to the detonation point, as well as winds that have reached 70 miles per hour. Napalm is unique in that it often sticks to the skin of people and is hard to remove even when it is burning. Napalm B is typically used to destroy enemy positions such as bunkers, foxholes, trenches, and shelters. One discharge of Napalm B from a low-level military plane can destroy an area of 2,500 square yards. And despite the prohibition of its use against civilians, international law does not prevent the use of napalm against military targets. What Are the Weapons Used By Infantry, Special Ops? Why Has the US Military Discontinued Use of Flamethrowers? What Is the Apache Helicopter Used For? You're in! Thanks for signing up. The Balance Careers is part of the Dotdash publishing family.